Mozart Arias for Baritone/Bass (The Vocal Library). Composed by Wolfgang Amadeus Mozart (1756-1791). For Piano, Vocal (Baritone/Bass). Vocal Collection. Play Along. Softcover with CD. 88 pages. Published by Hal Leonard (HL.740045).ISBN 0793562422. Play Along. 9x12 inches.Ten lyric arias with recorded accompaniments (Robert L. Larsen, pianist). 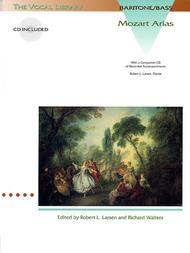 Edited by Robert L. Larsen and Richard Walters. With historical notes, plot synopses, and translations (by Martha Gerhart) for study. Contents: Aprite Un Po' Quegli • Deh, Vieni Alla Finestra • Der Vogelfanger Bin Ich Ja • Donne Mie La Fate a Tanti • Ein Madchen Oder Weibchen • Fin Ch'han Dal Vino • Hai Gia Vinta La Causa • Non Piu Andrai • Non Siate Ritrosi • Se Vuol Ballare.